Here at Astraseal Trade, we strive to provide home-improvement products that are at the forefront of the market. With that in mind, when constructing our uPVC windows and doors, we mainly use REHAU’s innovative profiles, as we feel they’re the best choice for installers and tradesman. In order to demonstrate this, we’d thought we compare them to Kommerling systems, which are one of the competing systems in the uPVC market. Kommerling are highly experienced in the UK market, having operated here since 1975, however this doesn’t mean they’ve developed the most energy efficient window system in that time. 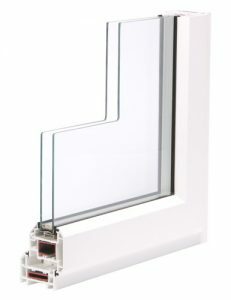 Utilising a highly insulating, multi-chambered profile, REHAU’s windows can achieve U-values of just 0.8 W/m2k when triple glazed. This means they’re able to achieve the Passivhaus standard, which is currently the most energy efficient specification for buildings in Europe. In terms of style, Kommerling’s C70 Gold® profile features a chamfered design, giving them a modern appearance, more suitable to contemporary styled homes. However, REHAU profiles are available with either sculptured, semi-sculptured or chamfered designs, ensuring they fit seamlessly onto properties of any style or age. This includes new builds, country cottages and terraced homes. Whilst Kommerling’s C70 Gold® uPVC window & door system offers plenty of scope for customisation – over 40 colours and woodgrain finishes to be exact – it is not nearly as versatile as the Total 70 uPVC profile from REHAU. The Total 70 profile is available in over 20 laminate foil options, however they can also be finished in over 150 RAL colours, to suit any property style. This is important because the more customisation options you have available, the more likely you’re able to satisfy the aesthetic desires of your customers. We hope this blog exemplifies exactly why REHAU systems are the best option for tradesman, across a variety of categories. And as we manufacture everything in our state-of-the-art facility, offering quick turnaround times and nationwide delivery, Astraseal Trade and REHAU are the perfect combination for any uPVC projects. For more information, call us on 01933 270552 or contact us online.